For a while I'd noticed tiny drops of oil on the overdrive housing, but the leak had recently become more pronounced, so now there was more gearbox oil than engine oil on the garage floor - especially since I'd done the tappet cover gaskets. 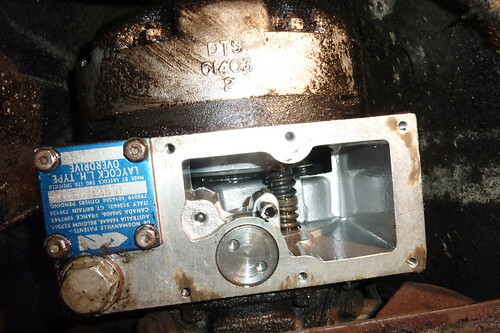 The overdrive gasket sits behind a cover with 6 bolts which are an easy removal. However the cover remained in place when I'd taken the screws off and wouldn't budge. Luckily there is a tab on the side of the cover next to the adjacent blue cover which allows the use of a screwdriver to remove it - good thinking on behalf of the designers! Once off you can see the two magnets sat in the dish of the cover. The ridges you can see in the photo aren't actually ridges but stripes of metal dust aligned to the magnets' polarity - the best way I can think of describing this deposit is like a magnetic paint. The old gasket remained attached to the housing and had to be scraped off, but once removed you get a nice view up into the overdrive itself. New gasket back on and cover back in place - not too tight with the bolts as the housing is aluminium and you risk stripping threads. Unfortunately it looks like the new gasket made little difference as there was soon additional drops back on the cover. Looks like the leak might have been from somewhere else which isn't good news as anywhere else will be tougher to fix.